As the number of proton therapy centers in operation grows, the amount of clinical data on proton therapy is increasing rapidly. Taking advantage of the day-to-day involvement with experienced clinical partners, IBA launched the initiative to gather and share information on the use of proton therapy in oncology. For some indications we have published white papers, for others there is a collection of recent research available in our bibliography on proton therapy research. Please note that IBA is a cancer diagnostics and treatment equipment company and cannot advise on specific clinical conditions. The use of conventional irradiation techniques can be accompanied by adverse effects that are highly undesirable, particularly in the case of a growing body. Irradiation with protons could prevent damage to important developing organs and preserve their function. Proton therapy benefits for pediatric cancers are significant. Tumors in the base of the skull are frequently difficult to treat due to their close proximity to structures such as the brainstem, brain, cranial nerves and optic nerves. Surgical removal can be difficult and the dose of radiation that can be delivered with standard X-ray radiation treatments can be restricted. For more information about base of skull and spine cancers treated by our clinical partners read our white paper. The treatment of ocular melanoma was one of the earliest uses of proton therapy. Since 1994, proton therapy has been regularly used in the United States to treat ocular cancers. 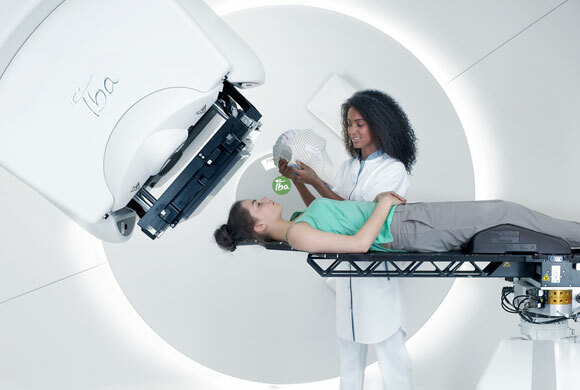 The reason is that proton therapy is very effective in achieving local control of the melanoma without adversely affecting the survival rates. Find out more information on our clinical partners' treatment of ocular melanoma. When treating head and neck tumors it is critical to protect the delicate organs that surround the tumor. Proton therapy can potentially reduce damage to eyes, optic nerves, salivary glands, and other organs near head and neck. Proton therapy benefits for head and neck cancers are significant. There are many different options available to treat lung cancer. Proton therapy is one of the most revolutionary methods of treatment, especially for stage III non-small cell lung cancer (NSCLC). Want more information about lung cancers treated by our clinical partners paper?